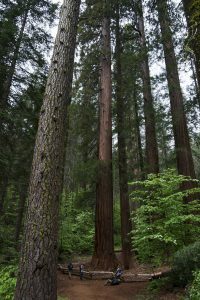 With a smaller parking lot in a less visited area of the park, this grove of about two dozen Giant Sequoias tends to be quieter than the other groves. The trail follows down an old road, descending about 500ft/150m in approximate 1.5mi/2.4km, through a wonderful forest full of massive Sugar Pines and Douglas Firs. Once you reach the Giant Sequoias, however, you realize what truly massive trees they are. Your first encounter is a grouping of five trees. Past this initial group look for more Sequoias scattered throughout the forest with their distinctive shape. You’ll come to an old log cabin where, if you continue a bit more, you’ll be able to see a few more Giant Sequoias. Once the trail narrows down and begins to get overgrown, you’ve seen the last of these massive wonders and the turnaround spot. Trailhead: The signed trailhead is located on the south side of the Big Oak Flat Road halfway between Crane Flat and the Big Oak Flat Entrance.